We offer a wide gamut of mens leather gloves manufactured from high quality metisse leather processed in our own tanneries. The gloves are comfortable to wear and are designed to protect the hands of the wearer. The gloves are heavily padded to provide extra protection. We are amongst the leading organizations engaged in manufacturing and trading a wide range of Leather Gloves. These leather gloves are demanded by a number of organizations for the purpose of gifting to their employees and workers. We offer these leather gloves at affordable price. 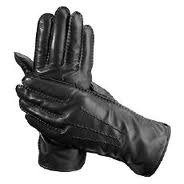 We are one of the leading suppliers of this domain, engaged in offering Men Leather Gloves. We are a well-established company in the market that is known to offer a broad range of Leather Gloves to our valuable clients. 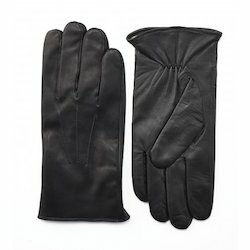 These Leather Gloves are cherished amongst our clients for its superior quality and unique design. Apart from this, our esteemed clients can avail these products at most affordable prices. Tritan Leather Works Pvt. Ltd.
We specialize in offering quality range of Leather Gloves, which is available in rounded cuff designing and has mesh panel for air flow that protect our palm. Furthermore, we provide our range in tough cotton drill lining. We provide our range in various sizes, designs and colors to our clients as per their requirement. In series of delivering world-class product line, we offer an exceptional array of Men's Leather Gloves that are durable in nature and are skin-friendly. They ensure complete movement of fingers and are tear-resistant. Our entire product range is neatly stitched using latest techniques and advanced methods. Description : The gloves made finest quality of Lamb Nappa with fabric. Exquisitely designed.